I recently found a short blurb about the Spring-Heeled Jack in a book called The Historic Notebook. In this book, the author takes events/terms/words that appeared throughout history that may not have been explained or were left as mysteries. 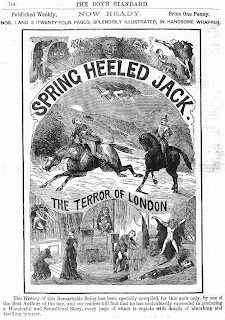 In this blurb the Spring-Heeled Jack was described as a group of confederates, rumored to be lead by the Marquis of Waterford. The Marquis of Waterford being one of the ‘Peerage of Ireland’ or noble families. This ‘gang’ or party taunted the people of London for six months until their ‘silly’ pranks ceased. There were never any cases of theft in encounters with the Spring-Heeled Jack, so with their main goal being to fright, they took the shape of several animals in different cities. Some of these animals included a white bull, a white bear, and a “gigantic baboon”! 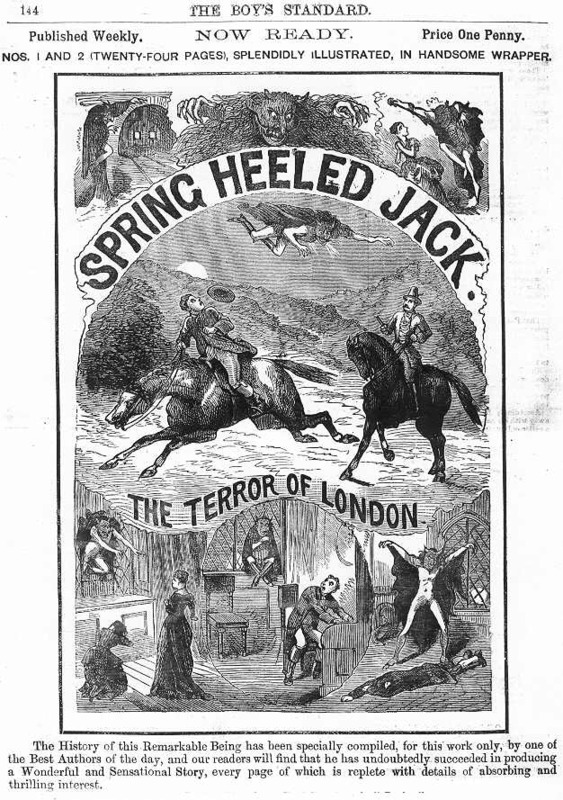 Spring-Heeled Jack also appeared as a man in bras armour. Often Spring-Heeled Jack would harass travelers and cause physical injuries, then disappear into the night. This piece from this book gave me a very interesting view of what the Spring-Heeled Jack is all about. From the different descriptions I have come across so far, he/it is explained to be an object of fear. He/it also seems to have some connection to the higher class. This will definitely give me some more information as I look into other sources. Maybe this may lead me to some literature about the Marquis family.